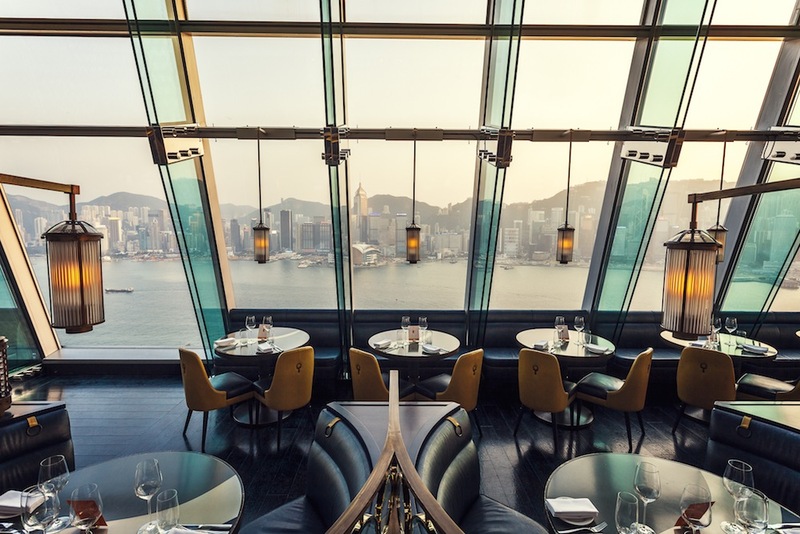 From the minute you step into the lift and it whooshes you well above the bustling streets of Tsim Sha Tsui, you feel like you’re in for a special experience at Aqua. Once we reached the 29th floor, we were guided to a cosy table by the window, and even though we couldn’t see much of the city through the fog and rain, it was quite cool to be so high up, watching the light show through the mist. Aqua has two kitchens, one Japanese, the other Italian, and we were offered a special set menu that featured items from both. While they’re not traditionally cuisines that you would expect to pair well, it’s nice to have the choice. We were treated to a glass of Prosecco while we perused the menu. I opted for Italian, and the first dish to appear, burrata cheese with cherry tomatoes ($288), was presented so beautifully I almost didn’t want to eat it. When I did succumb, it was wonderfully fresh and creamy. Meanwhile, my date’s first item from the Japanese menu was a selection of hand-crafted yellow tail sashimi, sweet shrimp and salmon tataki sushi ($258), which he pronounced “perfect.” Both starters were paired with a nice, earthy German riesling. For my main I chose the chef’s signature handmade truffle, potato and fresh egg-filled ravioli, with crutin cheese and shaved black truffle ($348). I can understand why this is a house specialty. It’s quite something when you cut into the pasta, cooked perfectly al dente, and the egg yolk oozes out. I’m a sucker for handmade pasta and truffles so this dish was a winner on all fronts. David stuck with the Japanese again, in the form of cedar-smoked, slow-cooked Wagyu beef with shiitake red wine sauce ($448). The meat was packed with flavour and melt-in-your-mouth tender. We washed all of this down with a mellow Californian red. Dessert for both was Aqua’s uber-glam signature dessert platter ($188), accompanied by a delightful, fruity moscato. The platter included several of the restaurant’s most popular desserts, our favourites of which were the tiramisu and a zingy lemon sorbet – but it was all very good. To finish, we were treated to a rather generous pouring of Limoncello. The service throughout the evening was wonderful and attentive. Aqua’s sommelier Ocean Cheung is clearly passionate about wine. He was very accommodating in his selections, offering wines that paired perfectly with two quite different sets of dishes. The restaurant was really busy the night we were there, but we didn’t feel rushed or neglected. We sat and took our time with each dish, something we never normally get the chance to do. For us, it was the ultimate date night, but it would also be a great place to take visitors or to get together with a group of friends on a special occasion.